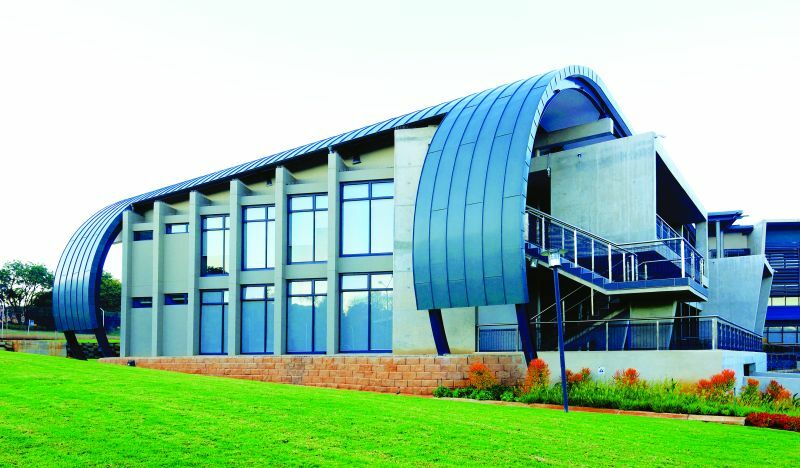 The brief for the two-phased extension to the National Research Foundation building in Persequor, Pretoria, was to complement the existing architecture, but not necessarily mimic it, which gave the appointed architects some freedom to update the building while reflecting the original. In designing the two new wings, one of which was intended for offices and the other which houses an auditorium and entertainment area, SNAPP Architects chose a brick fairly close to the original and repeated certain design features to maintain the rhythm of the building. But they also opted for some new, innovative materials. To form the elegant curvature on the northern facade of the wing that houses the auditorium, Rheinzink zinc alloy was specified as cladding and roofing material. “Because of the tight curve, no other product would give us the radius that we were looking for,” says Patrick Mann, partner at Snapp Architects. “In addition, it is a really cool material to work with,” he enthuses. Rheinzink zinc alloy is a contemporary building material that uses little energy during production and is 100% recyclable. It is a durable, robust material and over time, a patina is formed by natural weathering, protecting the material for years to come. “Interestingly, the substructure that is required for the Rheinzink installation also aided us in achieving optimal acoustics inside the auditorium,” Mann notes. “Bear in mind that having metal roof sheeting on an auditorium in an area prone to severe rainstorms and hail, can be quite a problem, so this was a huge plus for us. “Since Rheinzink is a premium product, however, it is important that the installation should be done by someone with experience,” notes Mann. The Rheinzink cladding and roofing on the curve were installed by Rohde Roofing, a boutique roofing company who has been responsible for installations across the country and who is an expert in working with this material. Caption main image: To form the elegant curvature on the northern façade, Rheinzink zinc alloy was specified to achieve the desired radius.